- Includes 1 rechargeable 300-mAh AA NiCd battery per unit. 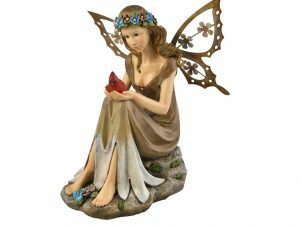 - Fairies are hand painted for a unique touch to your garden decor. - Blends into your gardens, walkways, patios, or pathways. - Beautiful cardinal bird glows red when dark. - Solar panel charges during the daylight and turns on at night.